The Izu Islands comprise over a dozen volcanic islands in Japan, spanning several hundred kilometres from south to east, off the coast the Izu Peninsula of Honshu. Part of Tokyo Prefecture, the islands spread across 300 kilometres in the Pacific Ocean. Known traditionally as the ‘seven islands’, they are each named Oshima, Toshima, Niijima, Kozushima, Miyakejima, Mikurajima and Hachijojima. Erupting six times in the last hundred years, it is one of the most active volcanic island chains in the world. 2000 saw a mass evacuation introduced due to high levels of sulphur, with visitors now required to carry gas masks. The islands are perfectly safe to visit, however. Each with their own unique appeal, the Izu Islands offer a mix of attractions. Blanketed by colourful camellias, Oshima is known for its active volcano, Mt Mihara and traditional female clothing items. Your ascent of the mountain will take you past hardened lava sediments from the 1986 eruption, taking roughly 45 minutes along the north-western trail, or an hour from Miharayama Onsen. The summit features the Museum of Volcanoes, covering everything you need to know about explosion patterns, formation and geography, with various photos and exhibits showcasing the island’s history. 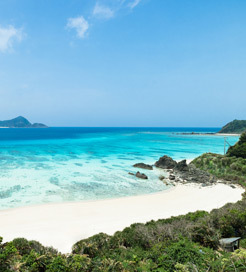 Beautiful sandy beaches can be found on the shores of Niijima and Kozujima, as can numerous fascinating ruins and shrines, while the best spots for dolphin watching are situated just offshore Mikurajima. However, throughout the archipelago, the most common pursuits include hiking dormant volcanoes, appreciating panoramic views, soaking in refreshing hot springs called ‘onsen’ and snorkelling in pristine waters amongst vividly coloured reefs. Ferries to the Izu Islands come regularly from the national capital city, Tokyo and various other cities as they are popular islands for short excursions from the mainland, with some routes taking as little as 35 minutes. Inter-island ferry routes represent an easy and reliable way of hopping between each fascinating destination within Izu, which are all operated by a leading Japanese ferry company. For more information, please visit our Ferries from Japan to Izu Islands page.